Pavi's Platter: Homemade Multi Millet Flour ! 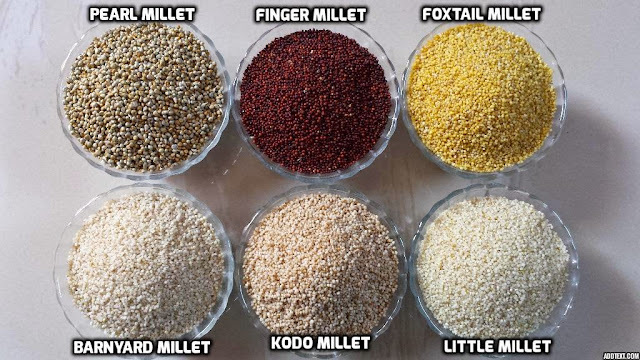 Millets also known as Sirudhaniyam in Tamil are very highly nutritious grain and best alternative to rice and even wheat. It is diabetic friendly , non glutinous and easy to digest. Millets have a low Glycemic Index means they release glucose very slowly in blood so that it becomes a good option for diabetic people. Millet flour is readily available in many shops nowadays but i always prefer making at home. I used all 6 types of millets here along with some oats and flaxseed that is purely optional. Roast the millets one by one on medium heat until they are roasted well but not burnt. Once cool, add the oats and flax seed powder and grind them in a mixer or in a flour mill. Store in a clean and tight container. Use it for making dosas, or add few spoons of this flour to your normal dosa batter. You can even add it to wheat flour (in less quantity) when making rotis. Mix this flour with water and just boil it on stove top , add some milk and jaggery and have like a porridge.